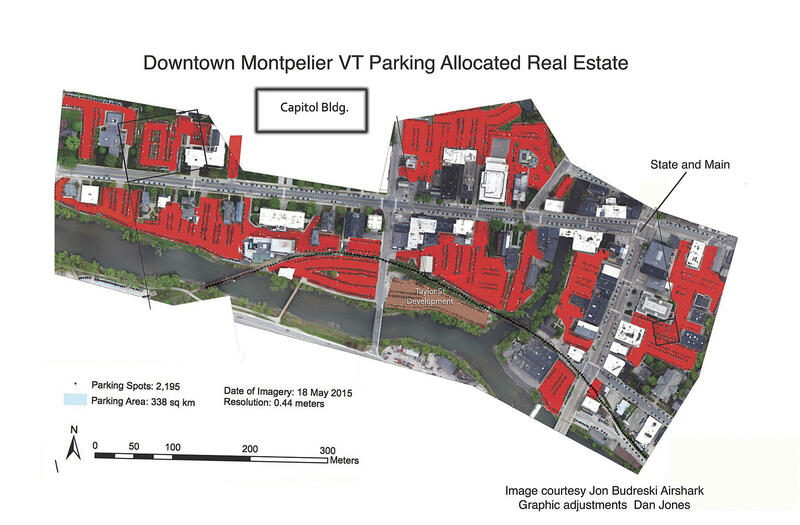 Dan Jones, of Net Zero Vermont, says too much of Montpelier's downtown is dedicated to commuter parking. 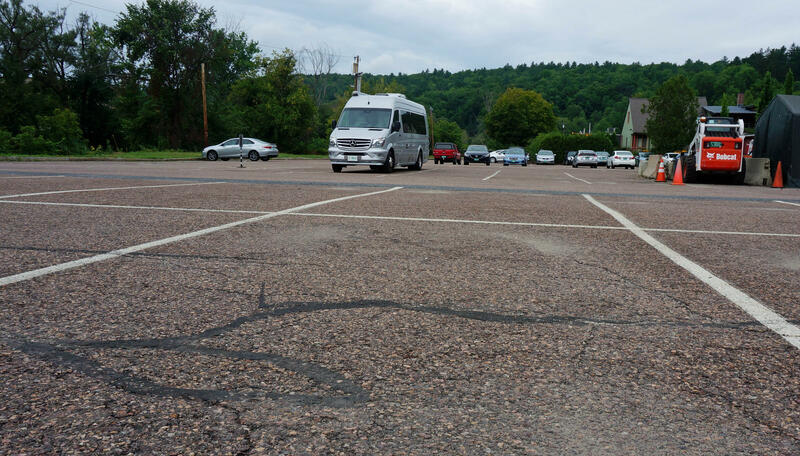 The City of Montpelier has set a goal to become the country's first net zero capital city, and a new nonprofit plans to take on what it calls the biggest obstacle to that goal: Montpelier's car culture. Dan Jones is the managing director of the nonprofit, called Net Zero Vermont. And Jones says much of that parking is taking up prime real estate, along the river and with views of the Statehouse. He says the majority of it isn’t open to the public. Most lots are dedicated to state employees or patrons of specific businesses. To change that situation, Net Zero Vermont is calling on teams of designers and architects from all over the world to come up with a better plan. The red areas on this map show the amount of real estate along State Street and Main Street dedicated to parking. The most popular designs will be vetted by a team of architects to determine the viability of the projects, and possibly make it through to the second round. Successful proposals will be refined into viable plans, and compete for the cash prize. But if all those parking spaces were turned into businesses and housing, where would people be able to leave their cars? On days when the state offices are closed, this riverfront property goes largely unused. The city of Montpelier has pledged to be carbon neutral by 2030. As a member of the city’s Energy Committee, Jones is familiar with the work already being done to move toward that goal. But he says the Net Zero Montpelier effort has yet to take on the biggest problem. As the city’s Director of Planning and Community Development, Mike Miller says he appreciates what Net Zero Vermont is trying to accomplish. Miller clarified that the pledge to make Montpelier net zero by 2030 is focused specifically on city government, including city offices and schools. Thus far, Miller says the city’s net zero efforts have been focused on lower-carbon ways to heat and power those buildings. A wood-burning downtown district heat plant has been put online. And Montpelier is pursuing solar power generation. 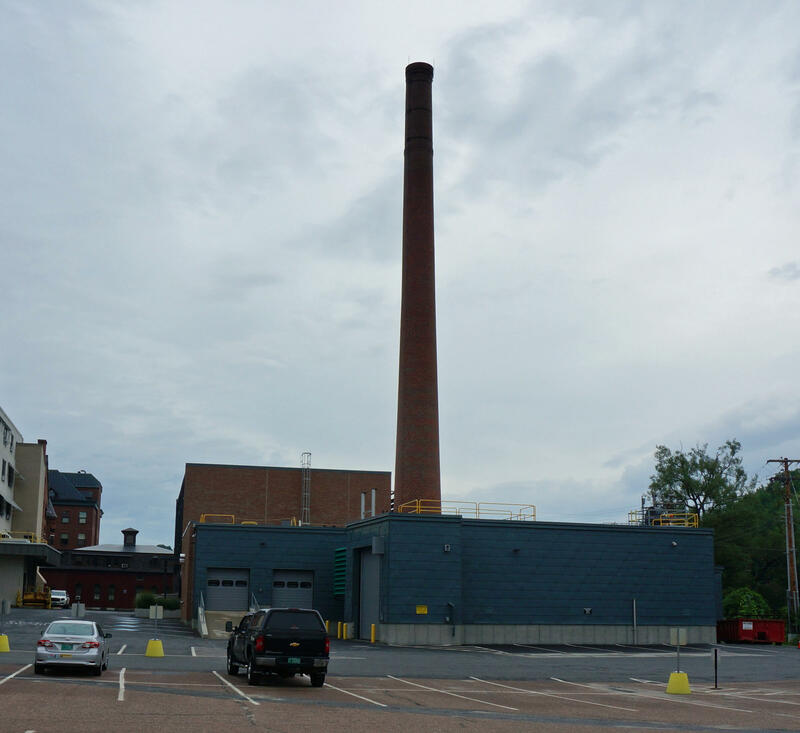 Montpelier's district heat plant provides wood heat to many city and state buildings downtown. Soon the city will also have to think about converting to a net zero fleet of vehicles, from police cars to snowplows. In the meantime, Miller says, it’s good to have a group like Net Zero Vermont looking at the bigger picture. And, Jones says, Montpelier is just the first step for Net Zero Vermont. He says the same problem exists in small cities around the state, and what works in Montpelier might also work in Barre, Rutland and St. Albans. A commercial wind project in southern Vermont that's been delayed for seven years is finally moving ahead. The Public Service Board held a much-anticipated hearing Thursday on a Vermont Gas Systems effort to build a pipeline through a wetland area in Geprags Park in Hinesburg. The state's largest utility says a new rate program will allow customers to save money while helping the utility to cut demand for electricity.